In a recent post I applauded efforts to estimate the true economic value of the mangroves along the coast of Mexico’s Baja California. 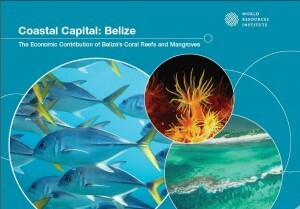 Last month the World Resources Institute (WRI) and World Wildlife Fund (WWF) released a report that estimates the economic value of Belize’s coral reefs and mangroves that I similarly applaud — in the hope that, by understanding the economic value of “services” that reefs and associated mangroves provide, and not just the aesthetic and biodiversity values of the reefs, the government, coastal communities and tourism and fishing industries will take better care of this resource. The Belize report was released, not coincidentally, the same day as the sobering “report card” on the Mesoamerican Reef (MAR) system to which the Belize reefs belong, showing just how much this resource is endangered. This is not the first reef valuation report WRI has done, and hopefully not the last. 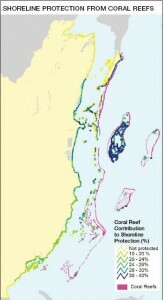 You can download PDFs of a consolidated report on the value of reefs in Tobago and St. Lucia or its executive summary. The main takeaway from the report? That Belize’s reefs provide up to US$559 million per year in environmental services — as much as 15% of Belize’s GDP in related tourism alone. Reinvigorate the Coastal Zone Management Authority and Institute and build capacity for monitoring the state and use of coastal resources. Tighten fishing regulations and invest greater resources in enforcement. Increase overall investment in marine protection areas (MPAs). Improve fee collection and monitoring of visitors. Build resilience to coral bleaching into the management and expansion of the MPA network. Enforce land-use and development regulations in the coastal zone. Minimize the loss of mangroves along the shoreline – they play an especially important role in fisheries and shoreline protection. Conduct and thoroughly evaluate Environmental Impact Assessments and subsequent compliance plans for development in sensitive coastal areas, such as the cayes. Incorporate sewage and solid waste disposal in planning for tourism development. 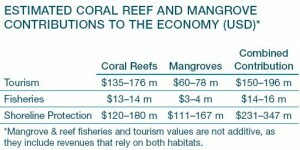 The cost of appropriate facilities can be compared to potential losses in reef services from further degradation. In planning a long-term tourism strategy, weigh revenues from a growing cruise industry against potential losses to the overnight sector from environmental impacts. Evaluate distributional effects (“winners” and “losers”) of proposed coastal development projects. Three key services provided by coral reefs and mangroves in Belize are worth an estimated US$395 million to US$559 million per year, according to a report released today by the World Resources Institute and the World Wildlife Fund. 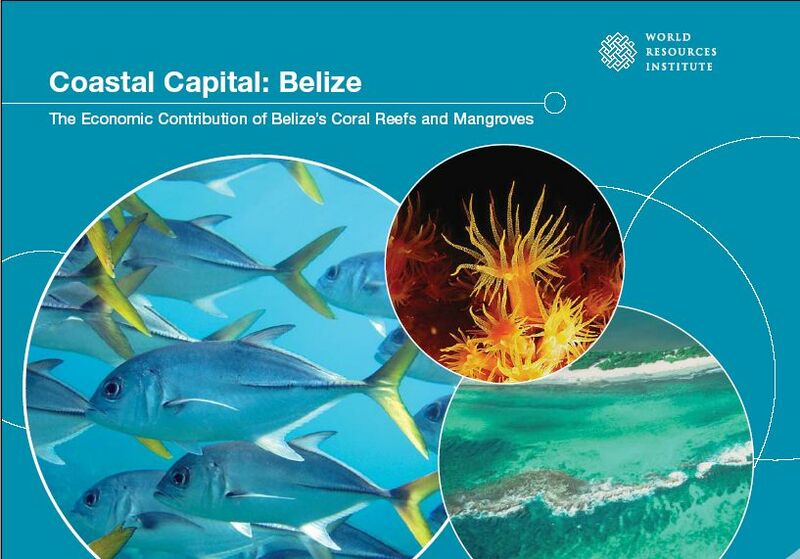 The report, Coastal Capital: Belize, estimates the annual economic value of coral reef- and mangrove-associated tourism in Belize at between US$150 million and US$196 million, accounting for between 12 and 15 percent of the Caribbean nation’s GDP. Benefits from reef- and mangrove-dependent fisheries contribute a further US$14 million to US$16 million to the economy. 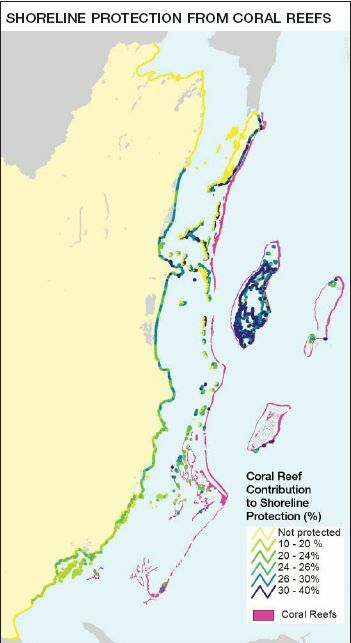 Reefs and mangroves also protect coastal properties from erosion and wave-induced damage. WRI estimates that Belize’s coral reefs provide an estimated US$120 million to US$180 million in avoided damages per year. Mangroves protect the coastline from both waves and storm surge, providing an additional US$111 million to US$167 million in protection annually. Despite growing recognition of the economic importance of coastal resources, reefs and mangroves face growing threats from unchecked coastal development, over-fishing, and pressures from tourism. Climate-related changes such as warming seas and fiercer storms will compound these impacts in the future. Belize’s Marine Protected Area (MPA) system is widely hailed as an example of forward-thinking in marine conservation. Consisting of 18 protected areas managed primarily by the country’s fisheries and forestry departments in collaboration with local NGOs, the MPAs are an important draw for divers, snorkelers and sport fishermen, and contain no-fishing areas that help to maintain stocks of key commercial species. The system, however, is under-funded, and staff, fuel, and equipment limitations make it difficult to curb illegal fishing and monitor visitation in most of the reserves. WRI’s Coastal Capital project receives key financial support from the Oak Foundation, the Netherlands Ministry of Foreign Affairs, SwedBio, the Campbell Foundation, and the MacArthur Foundation.